Bar associations have joined the conversation about succession planning and its necessity. To prevent neglect of client matters when the lawyer dies or if he or she becomes disabled, the duty of diligence may require that each sole practitioner prepare a plan, in conformity with applicable rules, that designates another competent lawyer to review client files, notify each client of the lawyer's death or disability, and determine whether there is a need for immediate protective action. 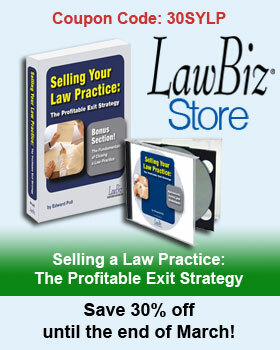 The ethical implications of failing to plan for a practice's future when the lawyer retires or dies are so severe that some state bar associations are also now taking action to “protect” the public. For example, the State Bar of California considered a requirement in 2010 for lawyers to have an “estate plan for the law practice” providing for succession in the event of a lawyer's death or disability. While the bar declined to act then, the issue may return for reconsideration in another form. However, even without this provision, the rules already command the lawyer to protect clients' interests, even after the lawyer's death. As another example, in 2007 the Indiana Supreme Court approved Rule 23, which encourages solo lawyers making their annual registration with the state bar to designate another lawyer to act as an “attorney surrogate” in the event of death or disability. If you need assistance in making plans for your firm, contact a legal coach today at 800-837-5880.